← Who was General James Wolfe? 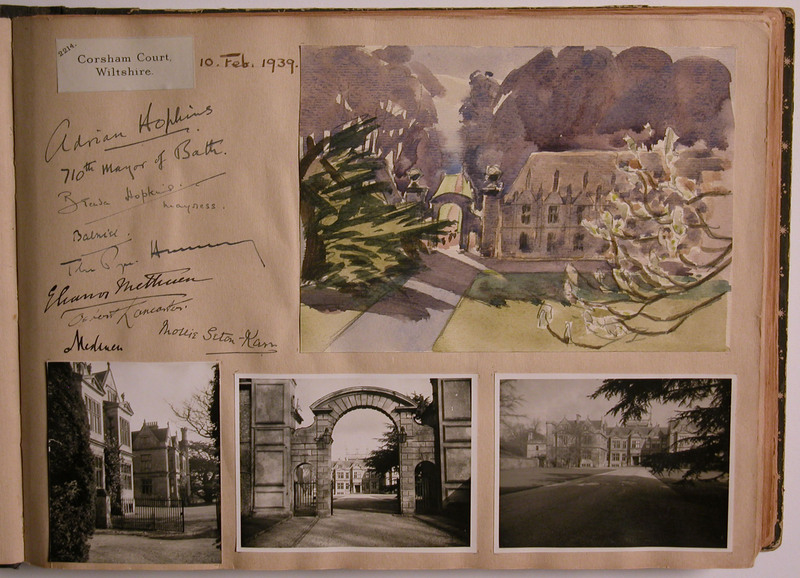 Part of the collections of Scotney Castle are seven visiting albums compiled by Christopher and Elizabeth Hussey covering a period from April 1936 through to September 1968. The first four albums for the period 1936-1955 are a record of country house visits paid almost entirely in England, Wales and Scotland, while the three albums for 1961-1968 record foreign holidays and travels. Over the last week I’ve been developing ways we could use these stunning albums in new ways. The first and simplest I’ve been working on is combining all the images into a single .PDF to use as an eBook. The second has been working on has been creating a page flip version of the album for use on a external device. Having no skill in creating flash files myself, I’ve been scouring the web and I’ve come up with a number of ways to do this, either using software or sending .PDF files to be converted. I’ve also discovered this free version of doing it, so far it seems to be working fine! Certainly technology like this is exciting and allows us to look at documents and books which are maybe too valuable or distant to be read in a traditional way. Digital versions of books seem to becoming more and more popular. Something apple seem keen to capitalise on with the launch of the book version of Itunes…..Ibooks! Having access to information easily is important and interesting but is the wow factor of lost in seeing only a digital copy? Can they really ever replace the real thing? Answers on an electronic postcard! I don’t think the wow factor will be lost in using digital copies of items in collections…however it does present a huge challenge. Something like the watercolours of Corsham Court would work being put into context in an artist’s studio or siting room where visitors can sit down and browse the digital collection…even a virtual one to add atmosphere and a sense of place… It also presents an ideal opportunity to ask questions and challenge our visitors…it makes it far easier to promote a two way conversation- a true sense of engagement. Have you thought of using ISSUU at http://issuu.com/ as another way to virtually flick through pages? I hadn’t, but it looks very interesting and is something I’ll probably try out. Thanks for the link!